Milo was posing for a photo so we could place him for adoption on a website. He is a rescue pup and I told him to sit and pose for his new family. Milo got a rough start in life when he was sold by an unconscionable breeder and then was shuffled through several homes including one family who neglected and abused him. Finally he came to use and we though we knew we couldn't keep him, we committed to finding him a permanent home where he would be appreciated. He was voted out by the rascally cats in our family when it became obvious he was convinced they were foxes and it was his JOB to corner them. 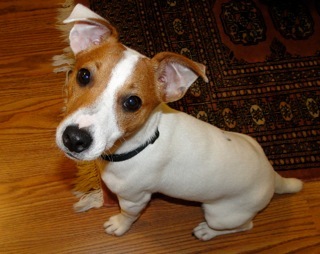 After careful consideration, we placed him with a family familiar with the JRT breed. Milo is very happy to be in a home where he has free run of a large secure yard, when he isn't digging out under the fence. He has a great home with a young couple who have lots of energy and love to offer, and want to keep him safe, happy, and entertained. It's a win for everyone because they are happy to let us visit with him. What an adorable puppy! We rescued our second Jack in March and she is such a LOVE! Bowser is pretty happy, too. I'll add pix soon! Thank you for posting and for your comments and for making a place for this lovely puppy in your hearts! This page brings me joy. I am Milo's new "mommy" and it's only been a short while since we adopted him, but I can't imagine life without him! He had wiggled his sweet self in my heart and taken it captive. I hate leaving him to go to work, but can't wait to get home to his precious self. Because of the abuse he suffered, he started out being very skittish of Chris, but patience and a whole lot of love changed that! Now he plays with Chris, "talks" to him, and pretty much isn't happy unless we're all three together so he doesn't have to run back and forth between us! He is quite the Houdini at escaping, but alas! Those days are over. Chris and I decided to put decorative paving stones in the spot he makes his escape, so I'm sure we will have one not so happy puppy when he discovers that! The little joker has thwarted all our other attempts...nailing up extra boards, putting huge logs in the way...everything! All that to say - we love this little pup and thank Bonnie and all of her family for rescuing such a great and loving dog and placing him with us. Check him out on Facebook to see all of his many adventures! Milo finally hit the jackpot and not only has a safe and loving home, but he is plugged into the social network scene. He may be reached via FaceBook at Milo de Pup. He is a real charmer, loves the ladies, his calendar is full, and he has more "friends" than his human counterparts! He appreciates Candice's comments and agrees, people should consider rescue options first. You can save the cost of breeder fees, SAVE A PUP, and still come away with a champion JRT like Milo. I have a soft spot for people who rescue Jack's since my Jack was rescued. After his rough start I'm so so happy that Milo has found such a wonderful home and kudos to you for seeing him through that!